She never thought that she would agree for an arranged marriage. But, now her engagement date was almost fixed. She never thought that she can fall in love again. But, now she had fallen for him. Yet, she was fighting hard to come out of her first love. She treasured it. She cried. She felt annoyed. She wondered what went wrong. Was it his career or her studies, she didn’t understand. Or worst, was it another girl? She did not know. She opened the balcony door. It was raining heavily. Rain has this effect. 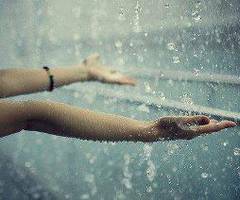 When we are happy, we feel like the rain is a gift for us. When we are sad, we feel as if, the World is weeping for us. At that moment, she was going through a dilemma. Her heart wanted to tell her fiancé about her first love. Her brain cautioned that it would be a dangerous confession. She was unsure. She climbed down the stairs and reached the courtyard. She held her hands out and felt the raindrops. It had a soothing effect on her. Her head was pounding and heart was racing. She wanted to call her fiancé and confess. But, she didn’t know what to say and what not to say. Karthik was her past. But, her fiancé was her present. She envisioned a future with him. And the same future scared her. She stepped out in the rain. As she began to get drenched, hot rolls of tears rolled down her cheeks. The tears were not visible due to the downpour. Similarly, Karthik’s absence still disturbed her. She still missed him. But, with the efflux of time, the degree of pain had reduced considerably. She was fighting a mental battle. And she was fighting alone. She wanted to get a solution. She was twenty seven years old and Karthik vanished from her life six years before. She sighed. She could not think pragmatically. “You are the one for me….” Her mobile started ringing. The ringtone suggested that it was her fiancé. She attended the call with reluctance. But, his voice was therapeutic. It reinforced that he is the one for her. She was taken aback. She was not nervous about the marriage. She wished not to start her new life with lies or by hiding the truth. She wanted him to accept her; accept her with all the stains and paintings. “Come on… I am marrying you. I am not worried about your past. I am not here to revamp your past, but to decorate your future… I will not ask anything about your past... I want to know nothing that hurts you. I want you and your happiness…” he said.